When Jude was just a wee toddler, Dan started a tradition of telling him an animal story at bedtime using Jude's stuffed animals. It was sure to be amusing, because funny is a guaranteed kid-pleaser. The stories were a smashing success and became a cherished part of the bedtime routine. And the rest is history. Every one of our children has adored his bedtime stories ever since. 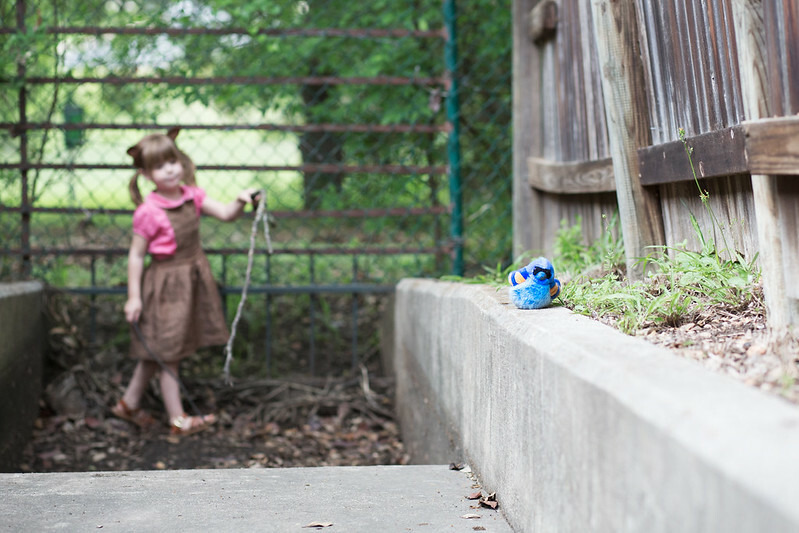 The current series is about Tia the songbird, Iris the bluebird (pictured above), and the antagonist, Sneaky Squirrel. 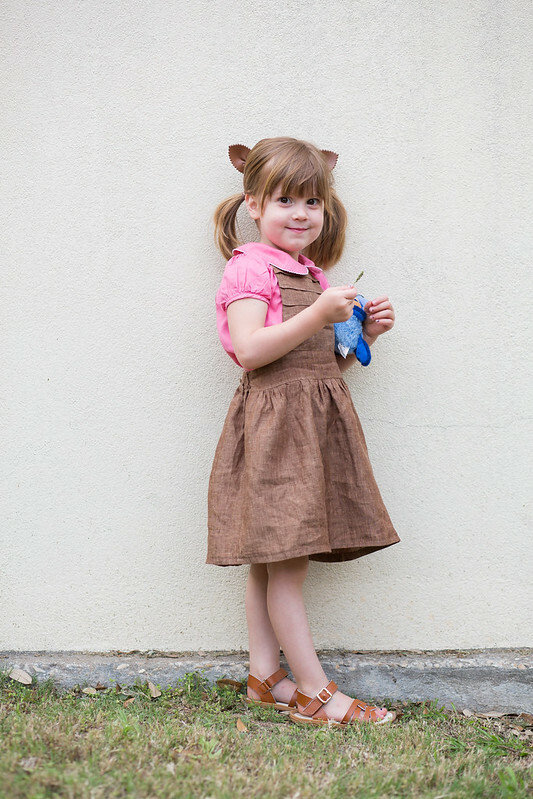 When Iris saw the Schoolhouse Pinafore pattern laying on my sewing table, she begged - begged - me to make it for her. 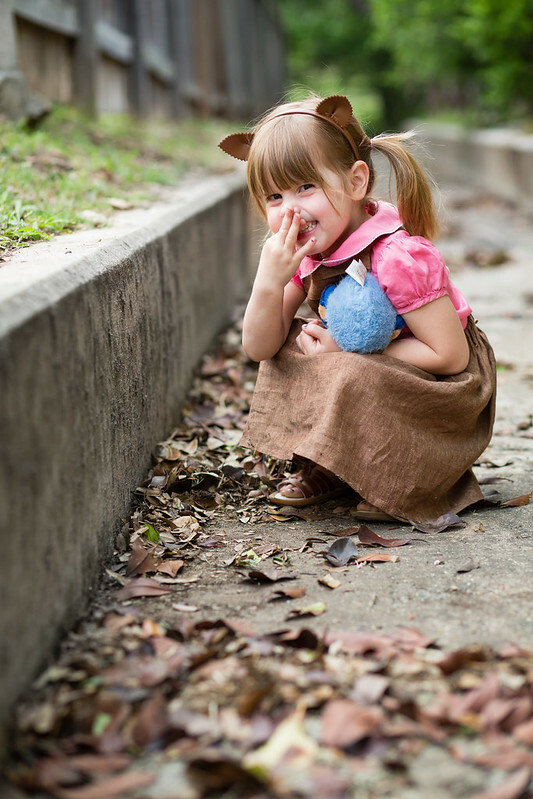 Mama, I can wear it with my squirrel headband and I will be Sneaky Squirrel! Please, mama! Well, how could I say no to that? It was already on my to-do list. 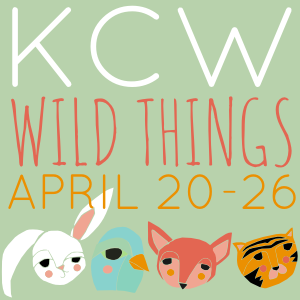 Not to mention it's kids clothes week and the theme is animals. It was meant to be. When I finished the front of the pinafore Iris exclaimed, "Oh my goodness, Mama, it's going to be so cute!" I want to just bottle her up right now. Everything she says is so darn adorable. I must, really must, be better about writing it down. "You stay right here Iris the bluebird. I'm going to play over there for awhile." I have to be honest and say the finishing on this pattern was a bit lacking. It reminded me of something you'd find on a free blog tutorial rather than a PDF pattern. And if you make this, definitely try on the straps before sewing them down. I cut off 3 1/2 inches from the straps! But once Iris put it on, all was forgiven. 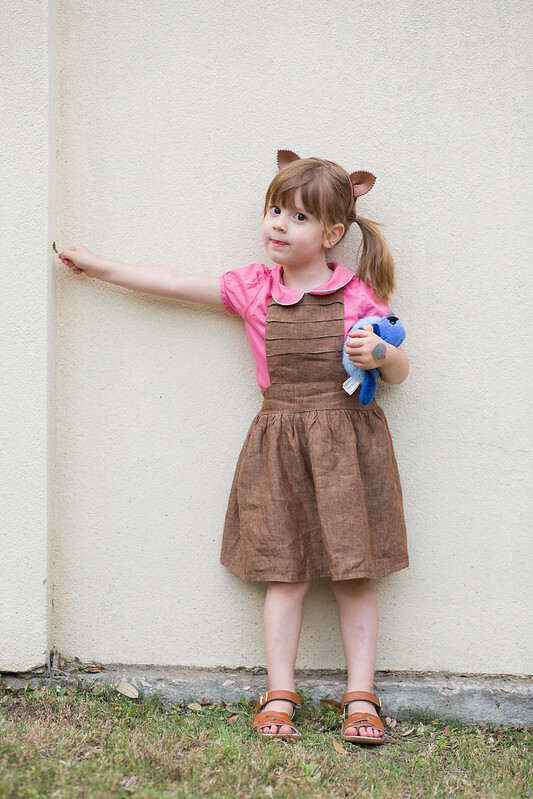 I can hardly handle how cute she is in it and really, the photos understate the cuteness. I love the pleated bodice. 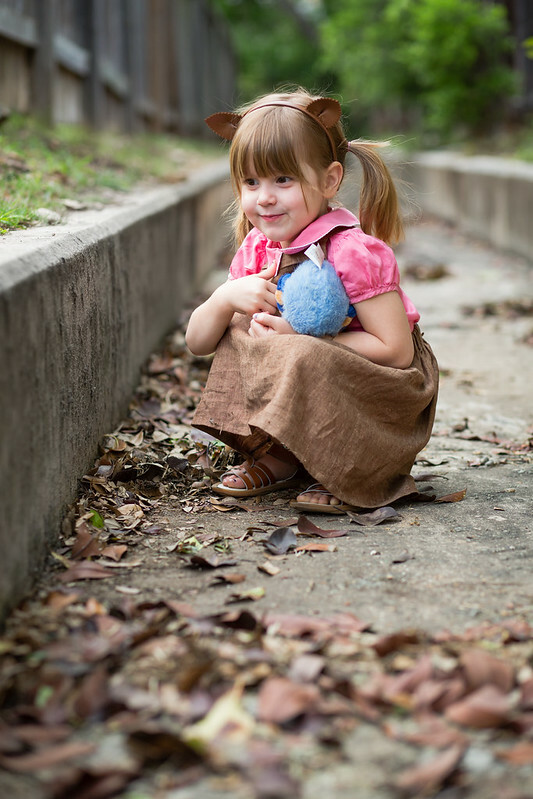 I made the pinafore with linen from Joanns again. I know I had been raving about Joann's linen, but this time it was a bit thin, it wrinkled like crazy, and wasn't as soft as I would have liked. I had to press (and starch) the heck out of it to get it to look like this. In hindsight, I wonder if a thicker, more stable material would have been better for this project? When she's not working on something for her stuffed animals, she's trying to make friends with the creatures of nature, with roly-polies (pill bugs) being a fav. "It's okay, little one. I won't hurt you." We let Iris pick out her own helmet. She chose this shark helmet. 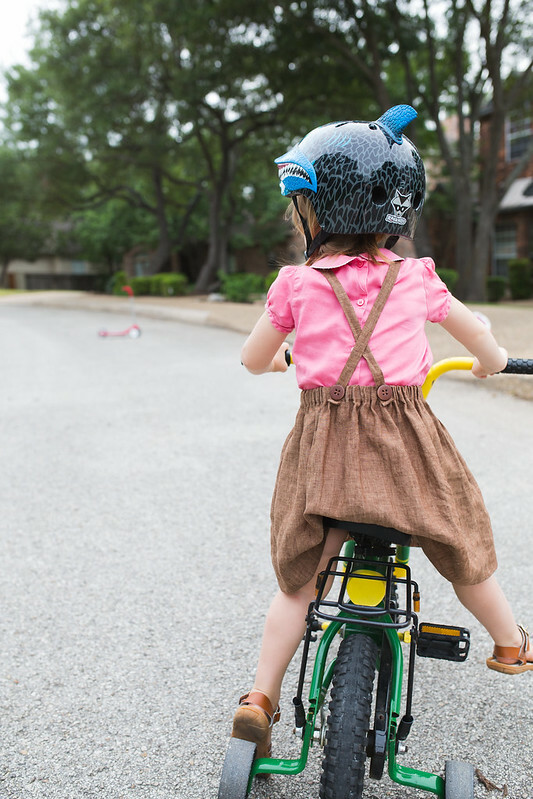 When she rides her bike, she smiles and grits her teeth, and then bites them together really quickly. Oh Iris! There's no doubt about it, 3 1/2 is pretty great! I love the 3s! I do wish she could come round to play with my daughter, they'd be hilarious together. She's looking very grown up with the pigtails and such a cute outfit. And made up dad stuff is just the best! Go Dan the storyman! Yes three year olds are totally adorable. Iris looks so cute in her squirrel outfit! Oh my! Iris is right, it is so cute! 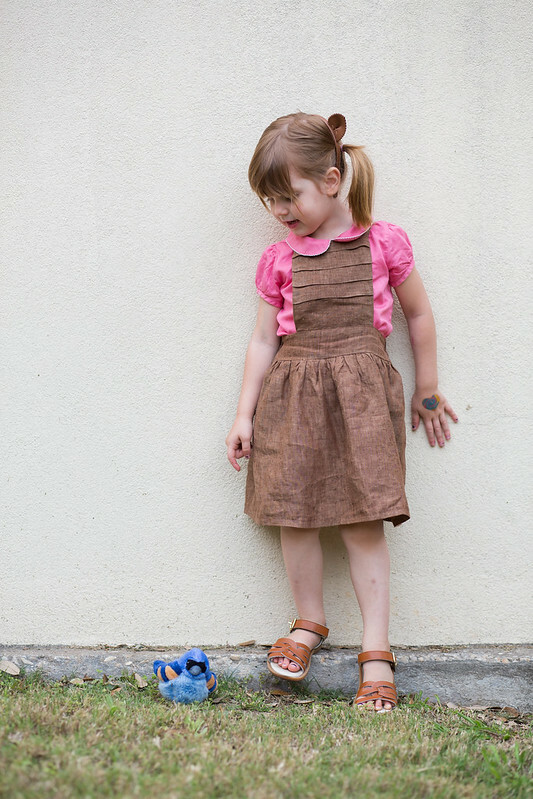 Love the pleats and the buttons...adorable! I think it's really cute in the linen! The front pleats are adorable, and I LOVE how enthusiastic she was about it. Sweet. Oh my word, she's adorable! Three year olds say the most hilarious things! I love writing it down, knowing it passes oh so quickly. The dress is really cute. I love the look of it in linen, and the colours are just lovely! "Oh my goodness," this is SOOOOO CUTE! 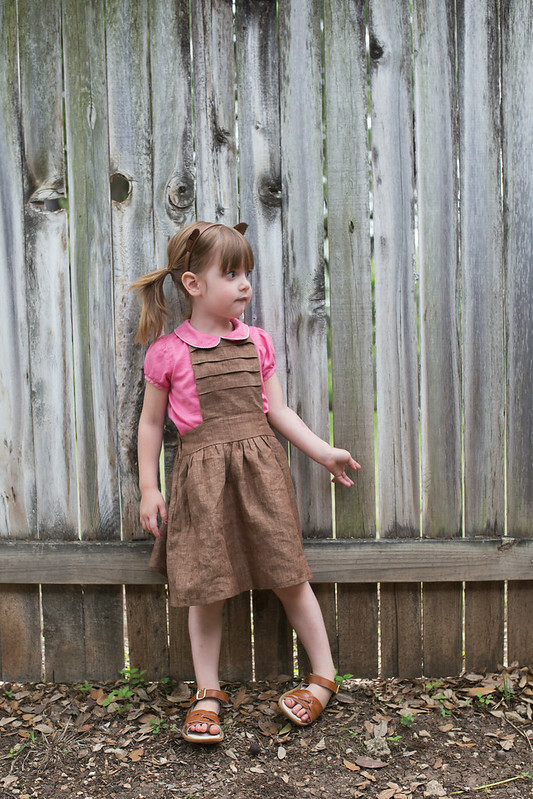 I love the little pinafore (the buttons on the back! ack!) and Iris is the cutest! Hard to believe Maggie will be three this summer - she's already talking up a storm, but it's usually Joe that says the little things that crack us up. It will be so fun when Maggie starts that too, and I really will try to record some of the remarks. My latest favorite from Joe was when we were watching Gene Kelly performing Singing in the Rain and he was like "He has a 'brella, why isn't he using it?" and then, later, "if he's happy being wet, why did he bring a 'brella?" Ah, my practical child. I second that 3 1/2 is really great. I would seriously be lacking my daily smiles without my little one! Ok, so I've spent the last little while scrolling through your archives. 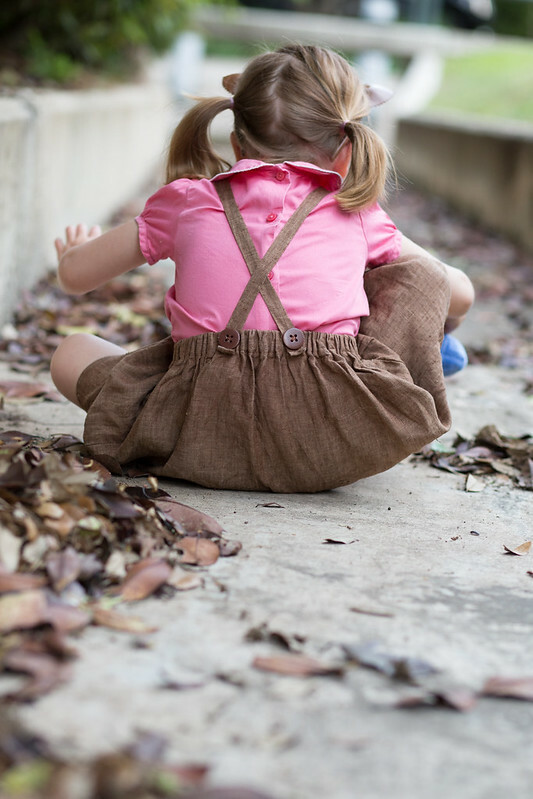 It's inspired me in so many ways: your beautiful handmade clothing, your homeschool journey (we're in our first year of homeschool), and your photography. Can I ask, what camera and lenses you use? So darn cute! I loved that age too. You did another fabulous job on this. It fits her so well. Love the animal story tradition. They will remember forever! I love your blog, it has really been inspiring me! 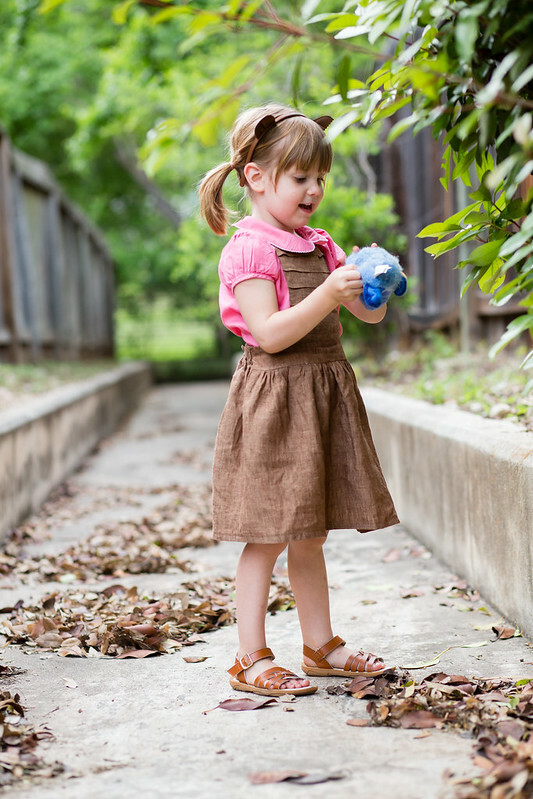 I was wondering where you get sandals for your girls...I'm looking for some for my daughter, and I love the ones I've seen in your pictures! i can't even handle this!!! iris, you're one adorable kid. love the sweet story about dan, too...what a great dad. Bummer about the finishes being lacking because what a sweet little pattern! The buttons on the back and the pleats are so perfect. And I love the sneaky squirrel!